This WonderPana FreeArc XL Core Unit Kit from FotodioX includes a WonderPana FreeArc XL Core Unit designed to specifically fit the Sigma 12-24mm f/4 DG HSM Art lens, as well as a WonderPana 8.0" Holder Bracket. Those items can be combined to allow for the convenient use of two 2.0mm-thick filters measuring 7.9" wide, or one 2.0mm-thick filter measuring 7.9" wide along with one FotodioX 186mm round filter behind it. 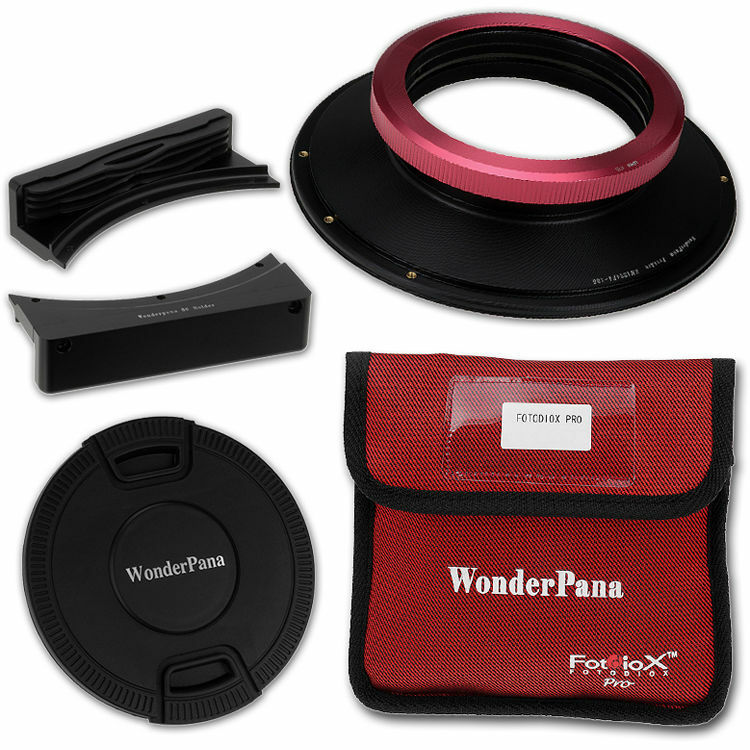 The included WonderPana FreeArc XL Core Unit consists of two components, a front filter holder and a rear lens collar. Placement of this FreeArc XL Core Unit onto a Sigma 12-24mm f/4 DG HSM Art lens is easily accomplished by sliding the rear lens collar over the rear of the lens until it has achieved a secure fit. Afterwards, the front filter holder can be screwed onto the front of the installed rear lens collar. To use the WonderPana 8.0" Holder Bracket with the FreeArc XL Core Unit for a Sigma 12-24mm f/4 DG HSM Art lens, pre-tapped threaded inserts along the edge of the front filter holder accommodate six of that holder bracket's eight included brass short-screws. Those screws ensure that a WonderPana 8.0" Holder Bracket's two assembly pieces are positioned parallel to each other and can hold a 7.9"-wide filter between them. Once the holder bracket and the front filter holder are combined, and the separate collar has been slid over the rear of a Sigma 12-24mm f/4 DG HSM Art lens, the front filter holder with the attached holder bracket can be screwed onto the installed rear lens collar. After being fitted onto a Sigma 12-24mm f/4 DG HSM Art lens, the bearing design of this WonderPana FreeArc XL Core Unit allows a WonderPana 8.0" Holder Bracket to be rotated 360°. This permits the use of graduated neutral density and other filters that are enhanced by varied positioning. This FotodioX WonderPana FreeArc XL Core Unit includes front filter threads, which allow a FotodioX 186mm round filter to be used along with the holder bracket. If a 186mm round filter is used on the attached WonderPana FreeArc XL Core Unit, the rectangular filter slot closest to the rear of the holder bracket becomes unavailable. The WonderPana 8.0" Holder Bracket features a durable and lightweight aluminum-alloy construction that has a corrosion-resistant, black anodized finish. The FotodioX 186mm Center-Pinch Snap-On Lens Cap for Select WonderPana Systems and Filters is a 186mm front lens cap with a squeeze, spring, and snap-on mechanism. It is easy to install as well as remove, and can attach to a WonderPana FreeArc XL filter holder system in order to protect the front element of a lens that any one of those systems are mounted on. Additionally, this lens cap can be used to protect a non-ultra slim FotodioX WonderPana 186mm filter mounted on a FotodioX WonderPana FreeArc XL filter holder system, with no other filter placed in front of it.